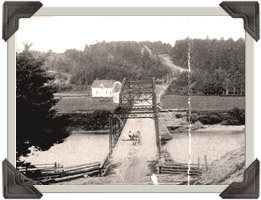 The Main River Bridge was built in 1897. A man by the name of Simms was boss. The steel work came from the Ruddick Foundry in Chatham, NB. The Stone for the butments was brought up the Miramichi River from David Curtis’ shore in Quarryville by means of six scows, with the tops planked over. These scows were towed up the river by horses. The horses walked along a toe path along the shore and the scow was steered by a long sweep up the rear or stern end. The scows were long and wide. After towing the load of stone up to the bridge and unloading it, the horses would be put on the scow for the trip down river. They would be fed on the way, so they would be ready for the trip up again. Blasting powder was used to break off the stone in large blocks. The grain of the stone was such that the large blocks would break to the line every time. A hand winch and tripod was used to load the stone onto the scows. The main river bridge in Blackville on the Miramichi was taken out by ice on Wednesday, February 4, 1970. The ice was 3 feet thick. For a while it passed under, but as the water rose it began to hit the floor of the bridge breaking off the steel supports. The noise could be heard for quite a distance. As the ice piled up against the railing, the great pressure shoved the end span off the butment and supported by the large ice cakes, it floated off down the river. One of the spans landed on Tom Boyd’s shore. It is said that twenty bridges in New Brunswick had been taken out by the ice jams at this time. All of Kingsbury Brown’s fishing camps at Six Mile on Cains River, Butterfield’s at Black Brook, and many others floated away. Bowne’s Cabin above Kennans, Belanger’s at Keenans, The Miramichi Renous Club’s Fishing Camp and William Hollowood’s Camps were badly damaged. On the North and Little South West Miramichi many dwellings were totally destroyed by the ice.